As a person who loves to travel, I'm a big fan of travel-related books. I like to pick up books on a new area that we are traveling to, so that I can plan ahead on all of the things that I want to see and do while visiting there. Over the years, I've amassed quite the collection of travel books and today, I get to introduce you to a new addition to my collection. Book Synopsis: This photographic guide to Martha's Vineyard features 101 specific ways to enjoy the island, whether you're looking for the freshest seafood, a secluded beach, or a day of adventure. Packed with tips, useful information, and a handy map, this will be your go-to vacation reference. My Thoughts: About 20 years ago I had the pleasure to visit Martha's Vineyard for a few days during a mini vacation. As a newbie to the island...I wasn't aware of all of the things that I could see and do. Matter of fact, we didn't venture too far away from where we were staying and basically just hung out on the beach and did some shopping nearby. Now that our 30th wedding anniversary is approaching we've been talking about visiting Martha's Vineyard again and this time...we really want to experience everything that the island has to offer. 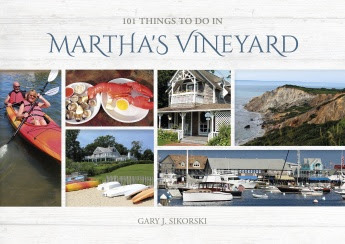 101 Things to do in Martha's Vineyard is a beautiful hardcover book that is jam-packed with all kinds of information. The author does a great job in pointing out the best places to eat, the best beaches for sunbathing, the best beaches for shelling (a hobby of mine), great places to shop, great places to grab a beer, where to go to the movies and everything else in between! It's comprehensive and I love that the author has visited all of these places and knows exactly what to recommend to others. The photography throughout this book is amazing! There are hundreds of photographs in the book with great descriptions of what each photo is about. Each place that the author recommends to you (there are 101 of them) includes the location/address and website (if applicable) so that you can easily find these places too. Not only that, he tells you exactly why he recommends each and every place! On pages 14-15 you'll find a Martha's Vineyard maps to help you get around during your trip. I absolutely LOVE this travel book! It's comprehensive and really easy to read. Plus, it's the type of travel book that you'll want to sit out as a coffee table book, so that others can "leaf" through it too. Disclaimer: Shelly H. received a complimentary copy of this book for review on her travel blog. No monetary compensation was received. Shelly's thoughts, opinions and words are her own 100% unbiased opinion. Your thoughts may differ. THis sounds like a wonderful book , not just for all the information it provides , but also for the stunining photos with detailed explanations. it would be a perfect guide and lovely as well.